If you're looking for ways to get more in touch with blockchain on your phone, these are the best Bitcoin apps to download. Ah, Bitcoin. You are the cryptocurrency that has become almost synonymous with blockchain technology, the main driver in the massive cryptocurrency boom, and the inspiration for hundreds of other alternative coins currently on the market. If you're like most Bitcoin investors or crypto geeks, you can't get enough of hearing Bitcoin news, trading cryptocurrency, or just using Bitcoin to pay for goods. That's precisely why app developers love making apps surrounding the new blockchain economy. People who want to connect to Bitcoin-related services have more options than ever before. Using your phone to reap the rewards of BTC is easier than ever, thanks to these best Bitcoin apps you can use. This is probably one of the best Bitcoin apps to ever be invented—and everyone knows it by name. CoinBase is one of the most secure and respected mobile cryptocurrency wallets in the world. It's also one of the only FDIC-insured wallets on the market, too. It's a world-class cryptocurrency exchange that allows you to load up cash straight from your debit card, and also provides an easy way to pay with Bitcoin, Ethereum, or other currencies. CoinBase also acts as an ideal way for new Bitcoin investors to learn the ropes. This app even has a debit card you can use to pay with Bitcoin. If you're worried about being able to figure out if you're falling for a Bitcoin scam, going with CoinBase is the best thing you can do. Cash App is currently tied with CoinBase when it comes to being one of the best Bitcoin apps for people looking to buy, sell, and spend using Bitcoin. This app, which was developed by merchant maker and cryptocurrency trailblazer Square, is designed to be a debit card service similar to CoinBase. The key difference here is that Cash App gives you full control over whether you want to convert the cash you load on into Bitcoin for storage—or if you just want to use it as a mobile debit card. It's one of the best Bitcoin apps for people who want instant access to their money, regardless. You might have heard of a lot of micro-investing apps that focus in on the stock exchange, ETFs, and similar stuff. Lawnmower is one of the best Bitcoin apps for people who want to invest in cryptocurrency but don't have hundreds of dollars to drop at one single time. Lawnmower works a lot like other micro-investing apps in the sense that it allows for super small investments. You only need to invest $5 per trade here, just like with other micro-investing apps like Stash. The big difference is, though, that Lawnmower invests it in Bitcoin and other cryptos of your choosing instead of stocks. Chances are, if you're looking at a list of the best Bitcoin apps on the market, you probably want to invest in a wider range of cryptocurrencies. However, if you're a smart investor (and we know you are), you probably want to learn more about each altcoin before you buy. Blockfolio is an ideal learning app for both new and experienced cryptocurrency investors. Everything from major stats, news, updates, and blockchain currency comparisons are at your fingertips with this app. 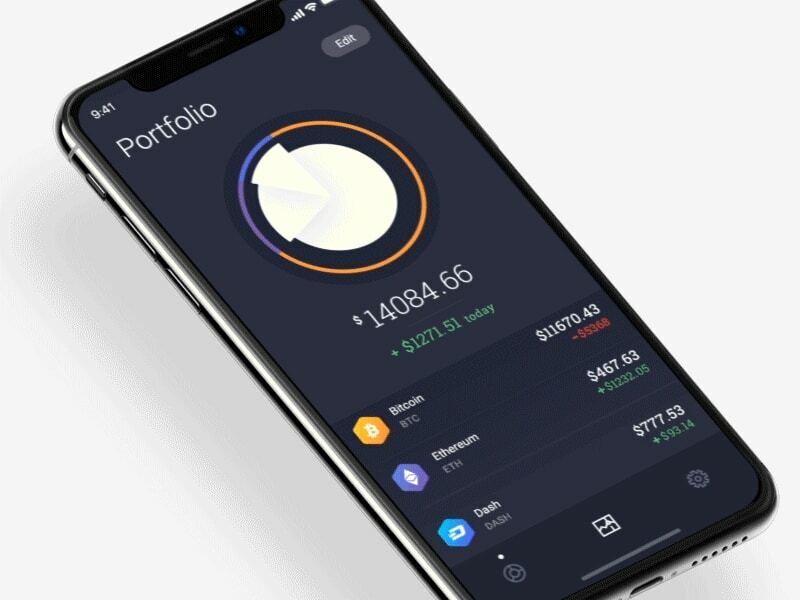 This is an amazing app for people who really want to diversify their portfolios in cryptos. Dozens of different coins are featured here—along with everyone's favorite, Bitcoin. Xapo is one of the most secure Bitcoin wallets on the net, in both terms of technology and insurance. Like Coinbase and Cash App, Xapo is designed using state-of-the-art cybersecurity measures as its standard. Also like Coinbase, it's heavily insured. What makes Xapo unique is the fact that it's fully insured, which means that you could lose every single penny you put in there and they will recover the costs for you. They'll insure all of your account, even if that means insuring millions. Coinbase's FDIC-insured policy is only up to $250,000. Xapo also provides a lot of different investments and methods of paying. Basically, any payment you want to use will be usable with this wallet. As a result, it's not only one of the best Bitcoin apps, but one of the best cryptocurrency apps ever made. Bitcoin investors love to stay abreast of all the latest goings-ons in the cryptocurrency world, and few apps are as good about real-time updates as Bitcoin Ticker. This is one of the best Bitcoin apps for keeping track of a wide variety of different coins—and for getting the latest Bitcoin news. If you need to stay as current as possible on crypto, Bitcoin Ticker is a great download to check. Almost every digital currency you'd want to buy is on it, and getting price alerts is a breeze. A lot of the best Bitcoin apps are proud to offer stats, news, and updates on your cryptocurrency investment portfolio, but not many can offer this kind of experience. This is one of the only investment apps that allows you to see your charts in augmented reality. Go ahead. Grab that 3D-rendering AR headset. You know you want to. The future is now, and investing never looked so sci-fi. So, you have all these wonderful Bitcoins, right? And you have nowhere you know of to spend them, right? It's a common issue; finding retailers that accept Bitcoin isn't easy. That's where CoinATM Radar comes into play. This cool little app shows you where you can exchange Bitcoins for cash in an ATM-like style near you. Over 35,000 different Bitcoin ATMs have been added so far, and that's why it's one of the best Bitcoin apps for people who want to have real-life use. Though we like to keep things serious when talking about Bitcoin, the truth is that there's a fun side to this currency revolution that needs to be discussed. On the app market, a number of fun Bitcoin-related games have been released. One of the most popular and regularly featured is Bitcoin Billionaire, a simple game that allows you to play the role of a Bitcoin investor as he makes a fortune. This clicker/tapping game is known for hilarious quips and relaxing fun. It's the lighter side of Bitcoin. Finally, one of the best Bitcoin apps for people who can't help but dig into news about this booming economy is Crypto Pro. Much like other cryptocurrency tickers, Crypto Pro is a great way to keep abreast of everything from currency prices to major developments in blockchain technology. If you love crypto news, Crypto Pro will be the news source and ticker you've always wanted. It's just that good.